Gotcha covered guards your mattress, health, and body and it is so comfy cozy you want to wrap your self up in it. You’ll love the waterproof polyurethane backing it not only protects your mattress but your manufacturers warranty. The backing is made from all recycled materials that are stable and inert. Thinking about wasteful packaging? Gotcha Covered doesn’t use any, only biodegradable packaging made from a hemp and corn film you wouldn’t know it’s not plastic packagng. Fully fitted like a shower cap so won’t slip off and you’ll love that it fits all thicknesses all the way up to and including extra deep 18 inch tall mattresses. 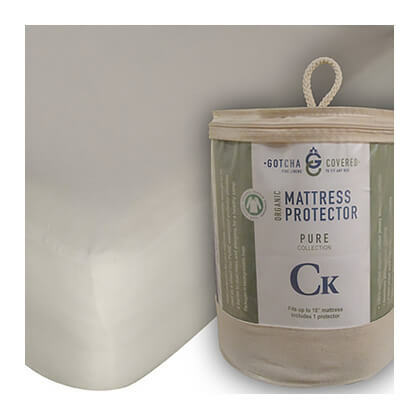 Shop our huge selection of mattress protectors now!